ORANJESTAD, Aruba (AP) -- Valero Energy Corp. has agreed to a settlement that would end a tax dispute over its idle refinery in the Caribbean island of Aruba, business and government officials said Thursday. The San Antonio-based company has agreed to pay roughly $111 million once the pact is approved by the Aruban Parliament, Valero spokesman Bill Day said. The settlement also calls for Valero refinery workers to remain on the payroll until at least June 1, 2010. The company would also make a minimum tax payment of $10 million per year as long as it owns the plant to resolve the dispute, Day said. Valero shut its Aruba refinery last June as falling prices for its refined products made the plant less profitable. The refinery had a capacity of about 275,000 barrels a day. The largest refining company in the U.S., Valero bought the Aruba plant in 2004 but has been looking to sell it. No date has been set for a sale, and the company has declined to provide further details. Day said the company "will continue to work with the new Aruban government to seek alternatives for the refinery." Prime Minister Mike Eman, whose People's Party took power last year after dominating September general elections, told reporters that "some very impressive companies are showing interest" in the plant "but the solution is not there yet." Jan. 21 (Bloomberg) -- Valero Energy Corp., the largest U.S. independent refiner, reached a tentative settlement with the Aruban government on a tax dispute that was the subject of international arbitration early last year. San Antonio-based Valero, which owns a refinery in Aruba, contested a tax on sales from the plant, which it said violated a tax-exemption agreement with a previous government. Under the settlement, Valero would make a one-time payment of 200 million florin ($112 million) and pay the Aruban government an additional $10 million annually if it retains the refinery, Bill Day, a Valero spokesman, said in a telephone interview. The tax that Valero had contested would be dropped. Under the agreement, Valero would retain the plants’ employees until at least June 1. The plant was shut indefinitely in August. Valero is seeking to sell the plant, and the retention of employees will allow the company to keep a staff should it find a buyer, said Johannes Anthony, president of the Independent Oil Workers Union of Aruba, in a telephone interview. “They will keep paying the workers, which will give them space for the negotiations to sell the place,” he said. The Aruba refinery has been on the block for more than two years. Valero has said it is in discussions with at least one potential buyer, which the Aruban government has identified as PetroChina Co.
Valero recorded a third-quarter loss that was 25 cents a share wider than initially reported because of the tax dispute. To contact the reporter on this story: Jessica Resnick-Ault in New York at jresnickault@bloomberg.net. ORANGE CITY - MEP Nilo Swaen (MEP) said that the agreement of the government with Valero at first sight a "cheap deal" appears. "The Government is supporting the Valero refinery to sell," said Swaen. The government on Wednesday reached an agreement with Valero. Sat Swaen as a former Minister of Finance and Economic Affairs frequently at the negotiating table with Valero. Especially when the American oil company in November 2008 took the decision to the refinery in San Nicolas to sell. For him, the agreement now before us is "nothing new". "It offers no long-term guarantee for a reopening of the refinery. Also gives no guarantee for long term investment in an upgrade of the refinery and I have no guarantee of environmental heard. " The investment is needed to the refinery in the long term profitable to make it through a wide range of oil products to sell. Since last year, the profit margins at Valero current oil pressure. The Aruba refinery closed last year with losses and Valero expects this year in the red figures. Swaen says that the abolition of the 1 percent bbo export cost the treasury 90 million florin. When the government he sat was also at one time considered this tariff abolition. That did not, because Valero in other areas was not prepared to make concessions. Asked why the American oil company now has come to an agreement and a better relationship with the current government, said Valero CEO Martin Parish yesterday that the arbitration case was heavy on the stomach. Wednesday it was announced that the Valero withdraws arbitration case, the Aruban government has now agreed to pay 200 million florin. This is the current government 85 percent of the tax that Valero had yet to meet. Swaen subsequently criticized. "The arbitration case, Valero is almost lost." The parliamentary groups of the largest opposition party believes that Valero them get away well, the refinery now back under the IPC Act (tax credits for imputation PLCs) are covered. Companies, such as a number of hotels covered, it will give them some tax advantages. "I've just abolished IPC last year for the refinery. So now comes back. "The reason for the abolition Swaen indicates that Valero after the expiry of the tax holiday than in the IPC-law would fall and would pay much less tax than other companies. The parliamentarian is also critical of the fixed amount of 10 million U.S. dollars annual profits that Valero must pay if they retain the refinery. "They are suffering loss, but what if they later florin 500 million profit? Then it gains very little. " NEW YORK (MarketWatch) - Valero Energy Corp. on Wednesday reported a narrower-than-expected loss from continuing operations, while the refinery giant cut its dividend in the face of weak demand for gasoline and other petroleum-based products. Valero (NYSE:VLO) said its fourth-quarter net loss narrowed to $1.41 billion, or $2.51 a share, from $3.28 billion, or $6.36 a share, in the year-earlier period. 30252015FMAMJJASON10The loss from continuing operations amounted to 28 cents a share, compared with profit from continuing operations of $1.53 in the year-ago period. Both figures exclude special items. Including items, the quarter's loss from continuing operations totaled 32 cents a share, against a loss of $6.22 a year earlier. Revenue rose 5.8% to $18.87 billion from $17.83 billion. Wall Street expected the San Antonio, Texas, refiner to post a loss of 45 cents a share on revenue of $18.48 billion, according to FactSet Research. "Weak demand, narrow margins, and low discounts in the fourth quarter exemplified how difficult refining conditions were in 2009," Valero Chairman and Chief Executive Bill Klesse said in a statement. "While 2009 may have been the bottom for refining profitability, there's too much inventory and spare refining capacity in the industry right now for margins to rebound quickly." Klesse reiterated the company's statement that it's in advanced talks to sell a refinery in Delaware City, Del. The company agreed with the government on a framework for a new tax structure "that has the potential to enhance Valero's strategic alternatives" for a refinery on the Caribbean island of Aruba. Valero plans to cut $100 million of costs in its business in 2010. It also reduced its quarterly dividend to 5 cents a share from 15 cents, payable March 17 to holders of record Feb. 17. NEW YORK -(Dow Jones)- Valero Energy Corp. (VLO: 18.68, 0, 0%) is vying to sell off troubled refineries this year while looking for attractive deals to purchase additional oil and ethanol plants, executives said in a conference call with analysts Wednesday. Valero is trying to sell its idle Aruba refinery that it admits wouldn't be profitable if it was running today and may be able to sell its Paulsboro, N.J., refinery instead of shutting it down, executives said. The company is pursuing a separate process for selling Paulsboro than its Delaware City, Del., refinery, which ceased operations in the fourth quarter. Last week, the company said it is negotiating the sale of Delaware City assets to an investment group headed by the plant's former owner, Thomas O'Malley, former chief executive of Petroplus. During the conference call, executives said that they are in talks with "interested parties" for Paulsboro. Valero pegged the book value of the Aruba refinery, which it has been trying to sell for more than a year, at $1 billion, versus $1.3 billion for Paulsboro. The Delaware City assets are valued at around $150 million. Paulsboro has the capacity to process 185,000 barrels a day and the Aruba plant's capacity is 235,000 barrels a day. Prior to its closure, Delaware City could process 210,000 barrels. During the bull market for commodities, these plants were raking in big profits for Valero thanks to their ability to process heavy, sour crude oil. This tougher-to-process crude traded at a wide discount to light, sweet blends of crude. However, that difference narrowed sharply during the economic downturn and those refineries started bleeding cash. Caris & Co. analyst Ann Kohler estimates that shutting Delaware City, which was losing about $1 million a day and required $200 million in maintenance work, resulted in $1 billion in averted costs. Tough conditions persisted for the entire U.S. refining industry, which has been plagued by inventory gluts and weak demand while oil prices more than doubled in 2009. The East Coast market is also a relatively more competitive market than the rest of the U.S. because it is well-supplied and competes against imports. Meanwhile, Valero has been having trouble finding a buyer for the Aruba refinery. It has also been involved in a tax dispute, which the company reiterated will be settled upon final approval from the government. "What's happening in 2010 as far as tax structure is not that important," Valero Chief Executive Bill Klesse said in the conference call with analysts. The tax agreement with Aruba's government spans 20 years, so that gives the company options as it looks for a buyer, he added. Valero has placed more than $200 million of cash in an escrow account while the dispute was in arbitration. Once the government approves the settlement, Valero will pay about $112 million in taxes and a minimum tax payment of $10 million a year as long as the company owns the refinery. Valero will continue to keep the plant's employees on the payroll until at least June 1, 2010. However, it is unlikely that the company will restart the refinery after executives said that it wouldn't be profitable if it was operating today. Valero also released an updated refinery turnaround schedule to improve operations at four other refineries. As the company seeks to sell off troubled assets and improve operations at existing facilities, Klesse said he's keeping an eye on deals to purchase additional refineries in Europe and North America. The company may also consider buying more ethanol plants. "We are very pleased with the ethanol business," as a lucrative bolt-on strategy to the core oil refining operations, Klesse said. Ethanol operating income rose to $94 million in the fourth quarter from $49 million the prior quarter. The company announced acquisitions for ten ethanol plants in 2009, of which three are expected close in early 2010. In the near-term, Valero said throughput at its oil refineries should average around 2.06 million-2.14 million barrels a day, versus 2.1 million barrels a day in the fourth quarter. Exports are expected to be lower due to lower demand from Europe that is being partly offset by greater shipments to Latin American countries such as Peru. Valero has 14 refineries with the capacity to process 2.8 million barrels of crude oil a day. ORANGE CITY - The Curaçao Curoil oil company wants to cooperate with companies in Aruba. She wants it to include areas of purchasing fuel. Curoil director Gensley Capella was last week on the island to the international energy conference PLATTS to attend. Between the acts he spoke about the Minister of Finance, Utilities, Energy and Communications Mike de Meza (AVP). According to Capella, the two islands together and buy cheaper fuel efficient. "There has been a collaboration between WEB and Aqualectra, where technical information is exchanged." Curoil talks with Aruba also help to deliver fuel to oil tankers, known as bunkering. "We have contact with Valero, but we have nothing concrete on paper for a structural cooperation. We want to do this, so both islands, but Bonaire, get a better service, "Capella said. According to the Director, the fuel prices for consumers in this way eventually be reduced. He points to earlier agreements between Aruba and Curacao for cooperation on cruise ships and ports. "Ultimately, the governments of both islands together true. We only facilitate, "Capella said. The Minister visited Meza PLATTS in the Westin Hotel. He met Curoil, but also the directors of WEB Aruba and Investment Bank (AIB). According to the minister were numerous topics, including the Aruban Arugas gas. The Meza also spoke with the director of the state oil company of Suriname. "They produce fuel for electricity, as Curoil. Very interesting, "said the minister. Frendsel Giel, president of Aruba Investment Bank, sees opportunities for synergy between Curacao and Aruba. "Synergy is important, especially when it comes to bulk purchases. The first type calls are good to go there to work. " ORANGE CITY - In the search for a new owner for the Valero refinery in Aruba from the Netherlands get help from a so-called energy envoy. This confirms Minister Mike Eman (AVP). The energy envoy will also help in decisions on gas around the island. Eman has discussed this with the Dutch Foreign Minister Maxime Verhagen (CDA). Verhagen has subsequently colleague Minister of Economic Affairs Maria van der Hoeven (CDA) approach. It proposes energy envoy Jan-Meinte Postma available. He must Aruba to help in finding a new owner for the refinery in San Nicolas and in making decisions on any gas in the waters around the island. Normally it is the duty of an energy envoy to the interests of the Netherlands abroad to defend. Postma is known as someone with many strong contacts, said Prime Minister Eman. Currently there are three serious candidates for acquisition of the refinery, PDVSA, Petrobras, and Petro China. Of the latter, the Aruban government recently heard nothing, said Eman. "The interest in our foundation for gas has recently grown," said Eman. This is due to the recent discovery of a large gas field north of Venezuela. The prime minister confirmed that the Aruban CAP oil company recently received several requests for test drilling for gas. Advice from the Netherlands by Eman is highly desirable, since the Netherlands much experience in gas extraction in Groningen. "In Aruba is still new. In 1988 and 1989 was the Aruban government requests for test drilling for oil. Now there is still mainly interested in gas. "Eman stressed that it is support from the Dutch government and not from Dutch energy companies. "We would like to get interest from energy companies, but so far we only contact with the Dutch government." gobierno venezolnao owing to otorga empresanan of spain, merca, hapon, india y malasia the derechjo of explotacion of two bloke in campo carabobo, in the belt of orinoco, cu for year 2016 is proyecta one produccion of at least 800.000 sweep daily paper of crudo y one inversion of 30.000 miyon dolar. the area carabobo and owing to wordo otorga at the consorcio conforma for her compania petrolero spanish repsol, petronas of malasia, y ongc, oil india corporation y india oil corporation of india, according confirmacion of the ministro of energía y chairman of pdvsa, rafael ramírez. the ministro of energy owing to tell cu the consorcio integra for repsol “a ofrece one bono of 1.050 miyon dolar for venezuela y 1.050 miyon dolar for financia the desaroyo of the proyecto”. ramírez owing to reitera cu the is calcula cu the area carabobo and have one potencial of produccion of till 480.000 sweep for day, y cu the proyecto is inclui construccion of one refineria cu capacidad of procesa 200.000 sweep for day. bloke carabobo have one reserva of some more cu 30.000 miyon sweep, according datonan of ministerio of energy y petroleum. 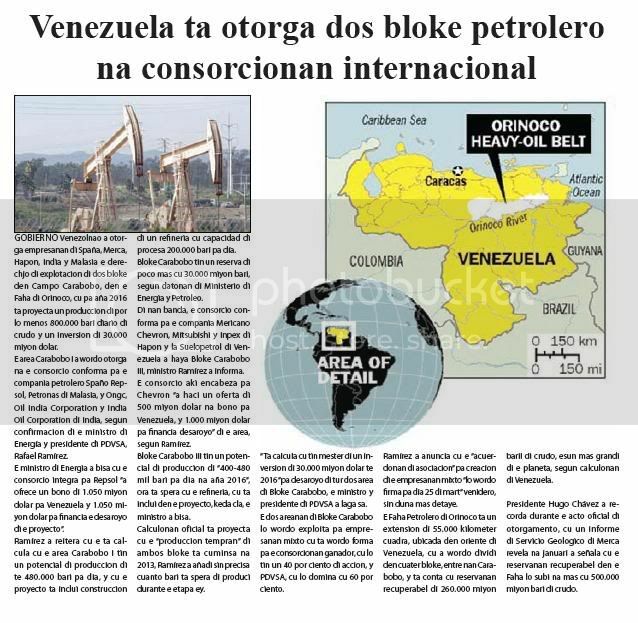 of they near, the consorcio conforma for her compania mericano chevron, mitsubishi y inpex of hapon y la suelopetrol of venezuela owing to achieve bloke carabobo iii, ministro ramírez owing to informa. the consorcio here encabeza for chevron “a haci one oferta of 500 miyon dolar at bono for venezuela, y 1.000 miyon dolar for financia desaroyo” of the area, according ramírez. bloke carabobo iii have one potencial of produccion of “400-480 thousand sweep for day at year 2016”, hour is wait for cu the refineria, cu is inclui in the proyecto, stay cla, the ministro owing to tell. calculonan oficial is proyecta cu the “produccion tempran” of both bloke is cuminsa at 2013, ramírez owing to añadi without precisa cuanto sweep is wait for of produci during the stage ey. “ta calcula cu have have to of one inversion of 30.000 miyon dolar till 2016” for desaroyo of all two area of bloke carabobo, the ministro y chairman of pdvsa owing to let know. the two areanan of bloke carabobo will wordo exploita for empresanan mixto cu is wordo form for her consorcionan ganador, cu will have one 40 can ciento of accion, y pdvsa, cu will domina cu 60 can ciento. ramírez owing to anuncia cu the “acuerdonan of asociacion” for creacion of the empresanan mixto “lo wordo company for day 25 of mart” venidero, without give more detaye. 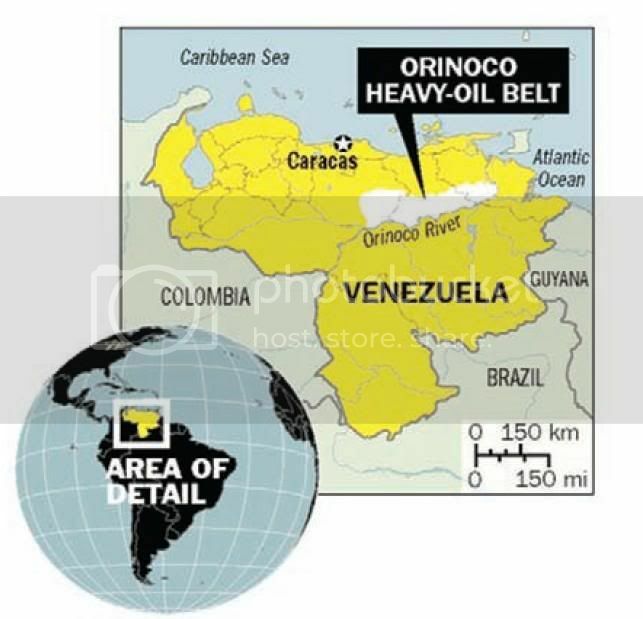 the belt petrolero of orinoco is one extension of 55.000 kilometer cuadra, ubicada in oriente of venezuela, cu owing to wordo dividi in cuater bloke, among they carabobo, y is count ; cu reservanan recuperabel of 260.000 miyon baril of crudo, esun more big of the planet, according calculonan of venezuela. chairman hugo chávez owing to recorda during the acto oficial of otorgamento, cu one informe of servicio geologico of merca revela at january owing to señala cu the reservanan recuperabel in the belt will lever at more cu 500.000 miyon sweep of crudo. Chevron Corporation says that a consortium led by its Venezuelan subsidiary has been selected to negotiate its participation in a project composed of three blocks in the Orinoco Oil Belt (Faja) of eastern Venezuela. Seems like Schaefer is losing?? I never did catch this one!Schaefer trying to sue AIG for not giving him a loan..WoW.You better loan me the money or else!Me thinks AIG was smarter then a few of the others who loaned the ol man money! Law360, New York (July 06, 2009) -- Superior Offshore International Inc. founder and ex-CEO Louis Schaefer has asked a bankruptcy judge for permission to sue American International Group Inc. on behalf of the undersea construction company for allegedly reneging on an $80 million loan agreement. Marine Log: Sharjah, UAE, headquartered Gulmar Offshore Middle East LLC reports that three diving support vessels have been released by Petroleos de Venezuela (PDVSA) and are now sailing to the US and Panama. The vessels' release by PDVSA comes after five months of negotiations resulted in the Venezuelan authorities removing these foreign flagged vessels from the list of assets that were to be potentially nationalized by Venezuela's "Organic Law" of May 7, 2009. Gulmar Offshore says it "continues to discuss with PDVSA compensation for the time the vessels were held in Lake Maracaibo and future possibilities for cooperation." 04/01/2010. This website was created by a global group of Seisma Energy Research AVV investors to warn other investors. This site also gives a running total of how many investors are in the group and how much they have invested. You have all been very patient with Seisma Energy Research AVV and Permian Asset Management AVV. Many of you tell me that they have now stopped communicating with you except to demand more money by e-mail. There industrial partners namely Evans Energy (E2) LLC, EnerMax Inc, 4G Group Companies LLC, are going to have a hard time proving that they did not know what Seisma Energy Research LLC & Permian Asset Management AVV have been up to. I am convinced that the only way to get our money back is to take legal action against all these companies. To keep individual costs down we need everyone that has invested to contribute towards the cost of legal action. 2. Copies of Seisma or Permian statements or E-6 pages for each joint venture. I will let you know what the costs are likely to be, by e-mail, before we start the process. You have my word that the information you provide me with will be treated as confidential and will not be passed to third parties without first receiving written consent from you. Remember Seisma Energy and Justin Solomon from Boca Raton relocated to Aruba, and formed joint venture with Permian Asset, Lincoln Gomez? Baaaaaaad Aruba! You no longer have to go to Aruba to get robbed and raped ..........they can do it by phone and offshore bank account! fifth DP vessel, the Gulmar Falcon , was placed in drydock for scheduled maintenance in July 2007 and is expected to return to service in Trinidad in September 2007.
term basis until it completes its current project. Page created in 6.155 seconds with 19 queries.